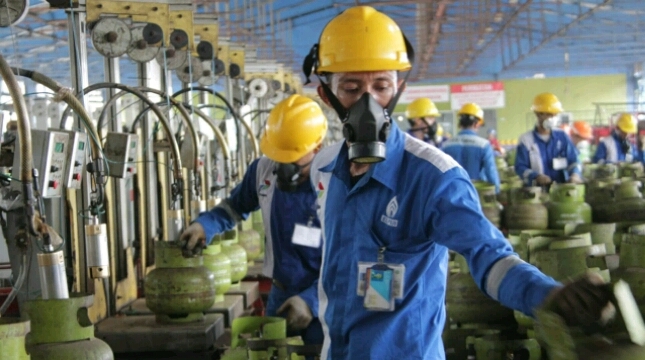 INDUSTRY.co.id - Jakarta - Along with the increase of public consumption of energy needs, energy supply is still safe until the peak of Idul Fitri 1439 H. There is no significant obstacle in accessing Fuel Oil (Liquified Natural Gas (LPG), gas network (jargas) and electricity. This success cannot be separated from the Government's focus in this week to ensure energy security. Supply and distribution of energy supply to the end of the delivery of consumers run smoothly. Anticipation of obstacles in the field can be resolved well. Through the EMR team post, the Government directly monitors the spikes of demand for energy demand. The results of this monitoring will be used as the basis of mapping in overcoming the disruption of energy supply. BBM, for example, guaranteed premium supply at 571 distributing agencies (reborn) in Java, Bali and Madura is targeted to be completed a week before Idul Fitri. This has an impact on the spike of fuel demand at the peak of homecoming flow (H-3), the final day of the work of private companies. Provision of 109 tankers, 32 car dispensers, 71 Kiosk Pertamax, 3 AKR packaging kiosks and 200 packaging motorcycles also facilitate the handling of increased fuel needs. Average energy resistance of all types of fuel over 20 days. The government also increased the stock of 3 kg LPG tubes between 6 and 8 percent in each region. In fact, about 31 thousand standby bases open 24 hours are prepared and placed near LPG Filling Station (SPBE) and LPG Depot. This is to minimize the disturbance that exists in the supplier and sub-distributor. Meanwhile, the large number of Jakarta residents who return to their homes and the holiday of industrial and business activities have an impact on the decrease of electricity consumption around 2,500 Mega Watt (MW) or 50% from the usual day. Even so, PLN Dis Jaya keeps alerting 1,616 personnel for 24 hours in 18 locations of PLN's distribution offices throughout Jakarta to secure power supplies. The peak of Idulfitri celebration runs safely because it is supported by a reliable national electrical reliability system. Recorded power capable of national electricity system on that day is 30,896,23 MW, while peak load only 26,459,58 MW. The operating reserves of the national electricity system reach 4,373.52 MW. For the mitigation of the Kegeologian disaster, the eruption of Mount Agung, Mount Merapi and an earthquake of 5.4 on the Richter scale on Wednesday (13/6/2018) in the Mentawai Islands did not cause any casualties as well as a significant impact on the surrounding environment. Moreover, the Government's appeal for non-activity in the hazard zone is run by the community closely. Not only that, Emergency Response Team PVMBG Geological Agency also yesterday (16/6/2018) plunge into Sumenep East Java to perform earthquake disaster mitigation stages of 4.8 SR. Coordinating with local BPBD, the emergency response team directly mapped out potential aftershocks in order not to cause harm to the local people. In general, the performance of the EMR sector post team headed by the Downstream Regulatory Agency (BPH Migas) should be appreciated because it can distribute the energy supply smoothly and able to map any disturbances that occur in the field.